Last week the first image was released of Rami Malek in full dress as Freddie Mercury for the upcoming movie Bohemian Rhapsody, and now a video has surfaced of Malek in motion as the legendary Queen front man. The movie will tell the story of the band, starting in 1970 and going all the way through their performance at the Live Aid event in 1985. 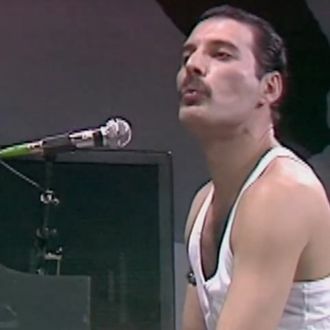 The nonofficial footage has been posted to YouTube, and it shows the band as they take the stage for the Live Aid show at Wembley Stadium in London. The Wembley set sounds like it might be the finale of the film, and it’s also one of the most vaunted performances in the history of rock music, which means getting it right for Bohemian Rhapsody is going to be a very big deal. And judging by the clip below, it looks like Malek has been taking the task of channeling Mercury extremely seriously. For reference, here is a video of Queen’s actual performance, which Malek has likely been playing on a loop since filming began.